We had a great deal of trouble finding the bin that they would put us into. The most terrible label we had glued onto us was the genre of world music - or new age music - which they gave to anything that there wasn't a name for. That is Glen Moore speaking about the problem record labels had pigeonholing Oregon. Moore was Oregon's bass player from inception until 2015, and the quote comes from an exemplary sleeve essay by jazz critic Charles Waring for a remastering of two of their classic albums. 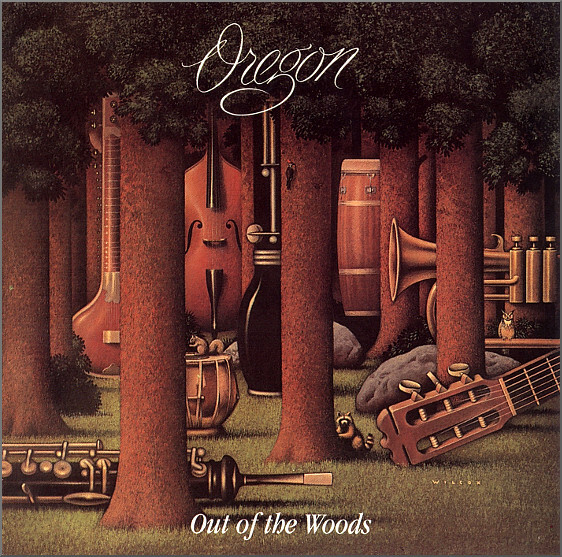 Out of the Woods and Roots in the Sky were recorded for Elektra in 1978 with Oregon's original and definitive line-up of Glen Moore, Paul McCandless, Ralph Towner and the incomparable Collin Walcott. This double CD comes from reissue specialist BGO Records who were responsible for the remastering of another ground-breaking recording that I praised here last year, Paul Horn in Kashmir. It is not just the sleeve documentation that is exemplary on this Oregon reissue: everything is exemplary, notably the musicianship and the stunning late-analogue sound captured at the legendary Long View Farm, North Brookfield, Massachusetts. Overgrown paths converge here as both the Oregon albums were engineered by David Greene who worked with Paul Horn on his Inside The Great Pyramid album, and whose other credits include the motion picture soundtrack album Dr. Zhivago. Back in the days of vinyl the problem was which browser bin to put genre-defying music in. Today the problem is even worse: the hegemony of digital technologies means metadata - what genre tag a music file is given - has a major impact on the audience it reaches. This binary rigidity is now also found in the non-virtual world, where, despite lipservice to inclusivity and diversity, the walls between genres are now higher than ever. For instance, the BBC Proms focuses on a narrower and narrower range of approved Western classical masterworks. When last did any of the current generation of art music journalists write with passion about anything other than Western classical music? And Classic FM, the station BBC Radio 3 tries so desperately to emulate, broadcasts nothing other than Western classical music. These walls prevent the vital refreshing of the creative gene pool. The inherent dualism of our binary age means everything has to be labelled and put in a neatly walled box. Which in turn means that despite Glen Moore saying one of the most terrible labels glued onto Oregon's music was 'new age', iTunes - the metadata arbiter of our digital age - consigns this genre-defying re-release to the 'new age' virtual bin. No review samples used. New Overgrown Path posts are available via RSS/email by entering your email address in the right-hand sidebar. Any copyrighted material is included for critical analysis, and will be removed at the request of copyright owner(s).